Carme Pinós is the architect for the 2018 MPavilion! Tania Davidge interviews Naomi Milgrom about philanthropy, the role of the MPavilion in the life of the city, and the qualities that Pinós brings to the commission. Philanthropist Naomi Milgrom. Photo: Steven Chee. Tania Davidge: Naomi, you are a well-known arts philanthropist and were recently the Commissioner of the Australian exhibition at the 2017 Venice Art Biennale. The MPavilion, while aligned with an interest in the arts, takes this in a new direction. What sparked your interest in architecture and the built environment? 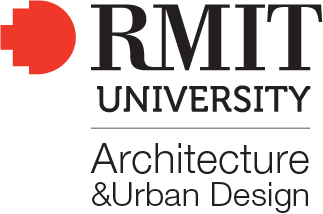 Naomi Milgrom: My passion for architecture and the built environment is born out of a broader love of design. In some ways, I don’t see my interest in architecture and the built environment as distinct from my interest in the arts – architecture is a live and important aspect of contemporary culture, and has the potential to explore the social, political, economic and environmental issues of our time. TD: In architecture and design we’re more accustomed to clients than philanthropists. (Although there are some very notable examples such as Phyllis Lambert, architect, founder of the Canadian Centre for Architecture and director of planning for the Seagram Building in New York, where she famously brought on board Mies van der Rohe.) How do you see your role as a philanthropist in Australia and how does this relate to architecture and the built environment? NM: The basis of my philanthropic interests lies in the concept of ‘collective creativity’, supporting the exchange of ideas and raising awareness through bringing together different people and organisations – nothing should exist in a vacuum. With the Naomi Milgrom Foundation, the idea is to create new public/private partnerships between the arts, business, philanthropic and government sectors to educate, inspire and be a driving force for social good. A big part of the vision, particularly with the MPavilion project, is also to bring design and architecture to a broader audience that may not otherwise meaningfully engage with it. Architecture should be for everyone, and MPavilion works hard to connect creative industries and the built environment sector to the public. TD: What was your initial vision for the MPavilion? Has this changed as the program has grown and developed? NM: My initial vision was for MPavilion to help promote Melbourne as the creative and design capital of Australia – to position Melbourne as Asia-Pacific’s hub of design and architecture. In a short amount of time, MPavilion has created an international reputation, and global connections for the city. 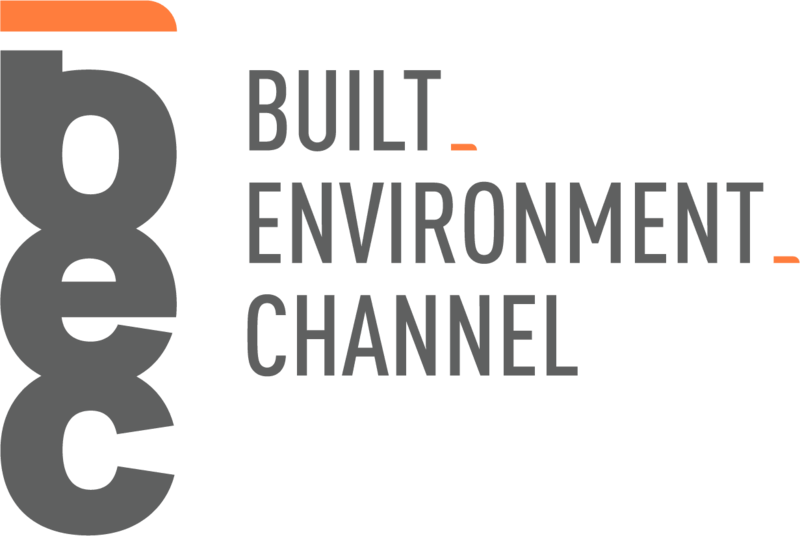 It exists to champion contemporary architecture, and to raise awareness about design and architecture and the cultural impacts of the built environment. The architect for each MPavilion is chosen by the Foundation based on their international profile, as well as their ability to encourage healthy debate about design, and to make a meaningful contribution to creative industries in Victoria. Each year, the architect has engendered a new direction for the MPavilion project. This year, for example, OMA’s interest in the countryside inspired our program to reach outwards to regional Victoria for the first time. As a result, we’ve enjoyed a proud collaboration with Shepparton Art Museum, Geelong Gallery and numerous other regional collaborators through this exciting new program. TD: How did you choose the site for the pavilion? NM: A central location was the main priority, and with so many amazing gardens in Melbourne, it made perfect sense to situate MPavilion within one of them. The Queen Victoria Gardens has a fabulous history of pavilions too, thanks to the late John Truscott. Truscott was instrumental in so much of Melbourne’s public art culture we enjoy today, and was responsible for the much-loved Botanica event in these very gardens. It also forms part of the Southbank Arts Precinct alongside the city’s renowned concert and arts venues. TD: It is a wonderful thing for the city of Melbourne to have this space in which to discuss and debate the city. One of the things that strikes me about the MPavilion is the way it is programmed. The programming brings each new pavilion to life. Through the programming you discover things about each pavilion you never imagined at first glance and that you might not have noticed if you just wandered through. Can you elaborate on the interaction between the events that are held in the pavilion and the form and context of the pavilion? NM: The MPavilion program is ever-evolving, and each year is deeply informed by the ideas and ethos of the commissioned architect. As I mentioned, MPavilion 2017, designed by OMA / Rem Koolhaas & David Gianotten, was hugely influenced by the interests and preoccupations of its architects – we’d be foolish not to engage with the rich oeuvre of not only OMA’s architectural achievements, but its critical research through AMO. Early discussions with the architects about the direction of this year’s program resulted directly in our inaugural Regional Program, as well as our inaugural call for proposals, which saw us open up program submissions to the public. A total of thirty-five events this season were initiated through the call for proposals. Broadening our reach was a big factor in this year’s program. 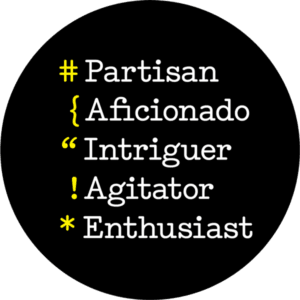 TD: Do you feel you have a hand in shaping the city? What do you feel is important to give as a legacy to the city of Melbourne? NM: I think MPavilion helps shape the city through discussion, debate and new partnerships in the creative industries and beyond. It contributes to a local and international dialogue around issues concerning our cities and regions, such as green spaces, public housing and urban developments. We look at Melbourne as the world’s most liveable city and what that means – what communities and cities will require in the future. In terms of legacy, each MPavilion is gifted to the City of Melbourne and relocated to a new permanent site for public enjoyment. It’s important to me that each MPavilion has a life beyond its season in the Queen Victoria Gardens. The most recent example of this is Bijoy Jain’s MPavilion 2016, which now lives at Melbourne Zoo. You can see for yourself what wonderful new shape it has taken in this unique location. TD: What is the most unexpected thing that the MPavilion commissions have revealed to you about the city and architecture? NM: MPavilion relies on that idiosyncratic Melburnian sense of curiosity, and the curiosity of those visiting Victoria. Each year, we see our visitation numbers skyrocket and exceed last year’s figures – it shouldn’t surprise me, but it does every time! It can only mean one thing – that people are engaging more and more with architecture and design, and are discovering how they might have a say in their cities. We can’t argue with that outcome. Carme Pinós. Photo: Livio Matticchio. TD: And we can’t forget Carme. I’m incredibly excited that Carme Pinós will be the next architect of the MPavilion. What is it about her and her work that compelled you to invite her to design the 2019 MPavilion? NM: I was first introduced to Carme by Sean Godsell, the architect of MPavilion 2014, and Glenn Murcutt and Wendy Lewin. I was immediately captivated. While visiting London last year, Carme and I discovered our mutual love of Balenciaga over lunch, and went to see the Balenciaga: Shaping Fashion exhibition at the V&A together, marvelling at the stunning clothes and accessories on display. Beyond our mutual love of fashion, there’s much about Carme that I admire, and that I think makes her the perfect architect for MPavilion 2018. I’m particularly interested in her work in public architecture – including public housing in Saint-Dizier, Madrid, and elsewhere. Her work across the board is always concerned with human experience and human stories. While partial to vast, sculptural forms, Carme doesn’t stand for over-elaborate architecture; rather, her work sees the responsibility of architecture to serve its community, and to create human connection. Being situated in the Queen Victoria Gardens, it’s important that MPavilion is sensitive to its surrounding environment, and I believe there’s no one better placed to marry context with their design than Carme Pinós. Something else that drew me to Carme is our shared interest in gender equality in our respective industries. 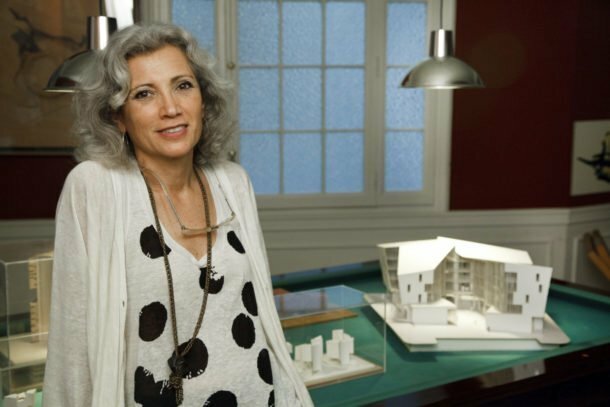 Carme’s dedication to promoting the advancement of women in the field of architecture, and in the communities with which she engages in her work, is vital and important. Carme will be the second woman to design the MPavilion, and her MPavilion 2018 will be the first public commission by a Spanish female architect in Australia. We’re incredibly excited to welcome her to Melbourne, and even more so to see what she comes up with for MPavilion 2018. Naomi Milgrom AO is an entrepreneur, collector of contemporary art and a supporter of the arts, science and education. In 2016, Naomi received a Philanthropy Leadership Award and earlier, in 2010, an Order of Australia (AO) for business and community leadership, and philanthropy. She chaired the Australian Centre for Contemporary Art (ACCA) for six years and has served on the boards of a variety of business, arts and science organisations. Naomi has supported publicly funded institutions and festivals including the Australian Chamber Orchestra, Melbourne Festival, Queensland Art Gallery, Australian Centre for the Moving Image, Sydney Dance Company, Melbourne Recital Centre and Sydney Biennale. 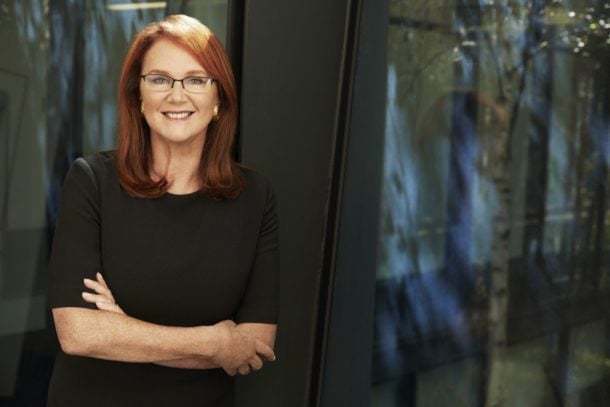 A leading Australian businesswoman, she is executive chair of the 550-store fashion retailer The Sussan Group, which includes brands Sportsgirl, Sussan and Suzanne Grae. Carme Pinós set up her own studio in 1991 after winning international recognition for her work with Enric Miralles. Pinós combines work as an architect with teaching, and is actively involved in the development and delivery of seminars, courses and workshops worldwide. She received the 2016 Berkeley-Rupp Architecture Professorship and Prize for her contribution to the advancement of women in architecture and her commitment to the community. In 2015, she was honoured with the Creu de Sant Jordi Medal, one of the highest civil distinctions awarded by the Catalan Government for cultural and social services. She received the First Prize at the 2008 Spanish Biennial of Architecture, the National Award for Public Architecture by the Catalan Government in 2008, and the National Architecture Award by the High Council of Spanish Architects. She was named Honorary Fellow of the American Institute of Architects in 2011 and RIBA International Fellow in 2013 for her outstanding contribution to architecture. Her work has been widely exhibited. In 2012, Carme Pinós launched OBJECTS, a collection of products designed, produced and commercialised by her own studio. Tania Davidge is an architect, writer, researcher and educator with a Master’s degree in Advanced Architectural Design from Columbia University in New York. As a director of the design and research practice OpenHAUS, Tania is interested in the relationship of people and communities to architecture, cities and public space. Tania provides analysis, research and commentary on what makes a vibrant and engaging public realm.